Welcome to the Weekly Wraparound, a recapping segment each Sunday talking about the week’s stories and happenings around the league. The first week of the season contained a lot of excitement and action. Everyone from rookies to the oldest of veterans has had success so far. There have been second chances and surprising starts. Let’s jump right into this week’s Wraparound. They’re How Old? Age is but a number for Jaromir Jagr (40), Ray Whitney (40), Martin Brodeur (40), Steve Sullivan (38) and Teemu Selanne (42). All four of these ageless wonders shocked the hockey world with amazing starts. Jagr scored 2 goals and 2 assists in his Dallas Stars debut. Whitney has 2 goals and 3 assists through 5 games. Brodeur is 3-0 in his first three starts, with a goals-against average of 0.98 and a save percentage of .958. Sullivan became the oldest Coyote to score a hat-trick (beating Ray Whitney) when he notched 3 goals against the Columbus Blue Jackets. He has 4 goals and an assist (3 powerplay points) in the first 5 games. Last but not least (the words ‘Selanne’ and ‘least’ have never before been used in the same sentence), Teemu Selanne has recorded 2 goals and 3 assists in the first 4 games as a 42-year old this season. They’re How Young? Rookies Vladimir Tarasenko (21), Jonathan Huberdeau (19), Justin Schultz (22), and Nail Yakupov (19) also had a great week. Tarasenko has 4 goals and 3 assists in 5 games for the St. Louis Blues. Huberdeau scored a goal and added 2 assists in his NHL debut with the Florida Panthers. Justin Schultz of the Edmonton Oilers has definitely met expectations. He has 6 points (2G, 4A) in 4 games including 4 powerplay points. He plays 24 minutes a night, and he already looks like a seasoned veteran. Yakupov has 2 goals for the Oilers and came through clutch for Edmonton by scoring the game-tying goal with 4 seconds left in regulation earlier this week against the Los Angeles Kings. We’re Back: Scott Gomez and Wade Redden, upon returning to their teams for training camp, were promptly sent back home. The Montreal Canadiens and New York Rangers did not want to risk either of those players getting injured (so they could buy them out). The St. Louis Blues took a gamble and signed Wade Redden, but not as a depth defenseman. Ken Hitchcock wants Redden to play on the top defense pairing with Alex Pietrangelo. Last night Wade scored in his second game. Scott Gomez was signed by the San Jose Sharks and will likely play tonight against the Vancouver Canucks. Strong Teams Land Face First: The bottom eight teams in the West include Detroit, Los Angeles, Phoenix, and Minnesota. The bottom eight in the East includes the Rangers, Flyers, and Capitals. Record Maker: Patrick Marleau became the second player in NHL history to open a season with four straight multi-goal games. Ottawa’s Cy Denneny, who did it in 1917-18, was that lone record holder to open a campaign with four multi-goal games prior to the start of this NHL season. 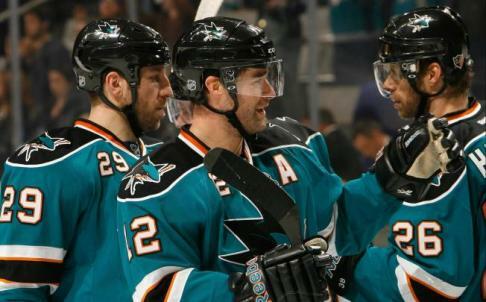 San Jose Sharks players Patrick Marleau (left), Ryane Clowe and Michal Handzus celebrate their victory over Colorado. Staged Fights: According to hockeyfights.com, there have been 45 fights in 64 games so far this season. There have also been 11 games with multiple fights. Many fans are tired of the “Opening faceoff, drop the gloves a second later” routine. Enforcers missed fighting so much during the lockout that they even began fighting with their minor league affiliate. Suter and Parise Right at Home: In the 4 games the Minnesota Wild have played, Zach Parise has scored 3 goals and notched 3 assists in his new home, and Ryan Suter has played very well defensively, helping the Wild to a decent start to their season. What Do You Mean You’re Not Coming? Lubomir Visnovsky of the New York Islanders failed to report to training camp. He had previously refused to rejoin his team when the NHL lockout ended, opting to stay with his KHL team Slovan Bratislava. The KHL later refused Visnovsky’s request for a KHL contract because of his “contractual obligations” in the NHL. Lubomir later stated that the reason he wanted to stay in the KHL was because of health issues regarding his son. Whether that’s true or not, would you want to return to the New York Islanders? Place Your Bates: Former NHLer Bates Battaglia (Carolina, Colorado, Washington, Toronto) and his brother Anthony will compete on The Amazing Race, the reality show about 11 pairs of teams race around the world, in hopes of winning a million dollars. This season will begin on February 17th. Schennspended: Flyer forward Brayden Schenn received a one-game suspension for barreling into defenseman Anton Volchenkov of the New Jersey Devils. This is the first “Shana-ban” of the season so far. What About Brad Stuart? Brad Stuart delivered a bone-crushing check to star forward Gabriel Landeskog of the Colorado Avalanche during yesterday’s game. Landeskog did not have his head down, and there was no way to avoid the hit. He did return later in the game, but the NHL decided not to suspend Stuart. I guess his punishment was just the beating he received from Avalanche defenseman Ryan O’Byrne following the hit. Kings Start to Krumble: The defending Stanley Cup champion Los Angeles Kings have had a very dismal start to their season. January 19th was their home-opener when they raised their championship banner into the rafters. It was also the day that Chicago scored five goals on Jonathan Quick, and handed them their first loss of the year. The Kings lost the next game…and then the following game after that in overtime. Last night was their first win, but their powerplay is still a weak 0-23, and their penalty killing units have given up 4 powerplay goals (1 each game). LA has the lowest ‘goals for’ total in the entire league (tied with Florida and Washington. Goaltender Battles: Ben Scrivens and James Reimer are in heated battle for the starting job in Toronto, and Roberto Luongo and Cory Schneider are still fighting to be number one in Vancouver. Scrivens opened the Leafs’ season with a 1 GA win against Montreal in Montreal (.960 SP). He lost the next game 2-1, which wasn’t too bad (.900). But then he lost his next start 7-4 (5 goals against) to the New York Islanders (.800). Reimer had a good start against Pittsburgh, giving up just 2 goals in a win (.933). His next start was last night against the New York Rangers, where the Rangers came from behind, scoring 4 goals against Reimer (.902). In his defense, the Rangers’ first line of Gaborik, Nash, and Richards is pretty intimidating. Cory Schneider was chosen as the starter for the Canucks’ first game of the season. However he gave up 5 goals (.643), and Luongo had to play the rest of the game, giving up 2 goals on 12 shots (.833). Luongo started the next game (the day after) and gave up 2 goals, losing in a shootout to the Edmonton Oilers. Schneider started the next game and gave up just 2 goals (.944). He also started last Friday, shutting out the Anaheim Ducks.